You know how WWE NXT leaves you spellbound and breathless when it's done? That wasn't the case this week, but the episode was still pretty strong. It was a good solid hour of wrestling. It was also an important show from a larger perspective. It had to be, didn't it? There was a title match on the show as well as a match to determine the Number 1 contender for the NXT Women's Championship. At least two of the matches on the show were very good. 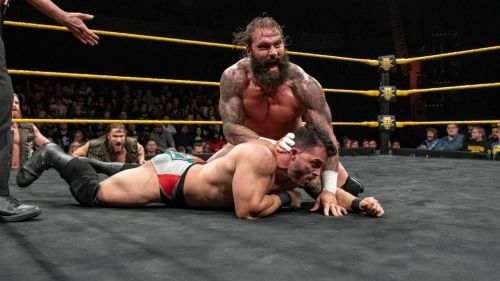 The third was little more than an exhibition match but went a long way in establishing a brand new NXT superstar. I will touch on all of these points in this article. Let me know your thoughts and opinions in the comments section right below. What a great and tough performance from Jaxson Ryker this week! The Forgotten Sons should be one of the acts to watch out for in the New Year. Jaxson Ryker proved just what was in store for his opponents as he pulverized an enhancement talent known as Mitch Taverna, who did not stand a chance. Ryker destroyed the man, leaving him in a heap in the middle of the ring. While The Forgotten Sons haven't really had a chance to showcase their wares in 2018, one can only see them climbing the ranks in the New Year. Especially after the next round of talent gets called up, it will be interesting to see what role the Forgotten Sons occupy. From the looks of it, they will certainly be heels, going forward. One of the things I noticed about this match is that there was no commentary for its entire duration. What a botch to make on such a big show!